SERVING ALMA, WI WITH FLOWERS FOR ALL OCCASIONS. FAMILY OWNED. VOTED #1! Fresh, colorful flowers are guaranteed to brighten any day or add the perfect touch for every special event. Alma Blooms is your one stop shop for a local atmosphere and worldwide service. Located in Alma, Wisconsin for resident shopping, they also provide 24-hour service in their online store. Their florists are experts in picking a variety of fresh flowers and creative gift ideas to suit any style or budget. They specialize in three main flower areas. Words are sometimes hard to find when a friend or loved one passes. Often, flowers better define the sympathy we feel for the family and our lost friend. Alma Blooms can help you communicate your feelings through flowers. Send flowers to a funeral is a time-honored tradition that can help to bring light to a bleak day. They specialize in everything from a small urn, lush standing sprays, casket flowers, or sympathy arrangements. 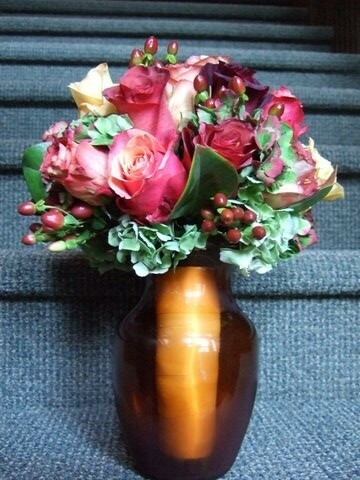 The special wedding day or big event isn't complete without the perfect arrangement of flowers. The team in Alma can provide for any budget. Providing an on-site consultation, Alma Blooms can design the picture-perfect arrangement. The changing seasons bring beautiful new flowers to life. They will offer unique designs that fit so well with the seasonal changes! Any event is sure to impress with the help of their expert florists. Looking for a gift for someone who has everything? Why not a new companion; a living, breathing houseplant? Not only do they provide fresh air, they are beautiful to look at and can be long-lasting members of any family. Need to add color to your home decor? Why not try a colorful croton or a lush schefflera? Stop by Alma Blooms for the best selection of indoor houseplants around. Whether you need a fully customized floral arrangement for that wedding or corporate event, a sentimental arrangement for a lost loved one, or a single rose for a special someone, Alma Blooms can provide for your every need! Be sure to find their 24-hour online store to see just how beautiful their flowers are!